"No Smoke No Poke feature"
"We took a trip out to the country last week to dodge the April showers and try and find ourselves a slice of Summer Fun. 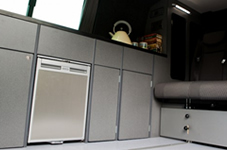 Welcome to Camper Mad, aptly named to reflect how we feel about these wonderful versatile moving homes for you to enjoy your holiday in pure luxury. 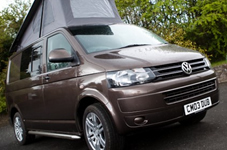 We are very proud of our fleet of four T5 campers, lovingly designed in such a way that each have their own individuality to suit your every need. 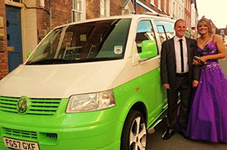 We as a family have spent many pleasurable trips and each van is tailor made to suit everyone's tastes and individual needs. We have made it as easy as possible by just clicking on your choice of van profile which will give you full details of each and how to book. 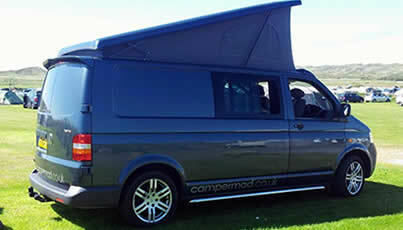 We can confidently say that you will enjoy every minute that you spend in these vans whether it be to arrive in style for your big day, then to zoom off into the sunset for the honeymoon of your dreams, or to show off in front of your pals at your school leavers prom, or to just chill & unwind on your favourite beach or in the middle of a remote field. The choice is entirely up to you, we are here to help you in every way we can, all you have to do is ask. We look forward to meeting you all & sharing our wonderful vans with you. To enquire about booking, availability or any other enquiries, please contact us any time using the contact form, alternatively Please feel free to email us directly or Telephone us on 01568 720531 with any questions you may have. We look forward to hearing from you. We look forward to hearing from you.